Edmonton Oilers prospect Linus Omark has made quite a name for himself, but it hasn’t been in the NHL. His highlight reel shoot-out goals in Europe made him a YouTube sensation, and maybe a little bit of the fame went to his head. Despite his all world skill, Oilers management weren’t about to give him a free pass. They wanted the youngster to earn his spot in the NHL and work hard in the American Hockey League to get it. Despite posting 27 points in 51 games last season, Omark found himself a healthy scratch and was eventually sent back to the AHL. Omark wasn’t pleased with the demotion, and was admittedly angry. He questioned his role in the Oilers organization and hinted that he’d return to Europe if he didn’t get a chance in Edmonton. He was also the center of a controversy last season when his shoot-out goal vs. the Tampa Bay Lightning didn’t sit well with the veterans. This season, however, Omark hasn’t said much, other than expressing his desire to play in the NHL. Omark is a restricted free agent this summer, and the team has a choice to make as to whether he’s part of the long term plans. Head Coach Tom Renney hasn’t committed either way to the status of the feisty winger, but a good performance might give him something to thing about. Omark didn’t dress for the Oilers game against the Ducks on Monday, but he was in the line-up against the San Jose Sharks. He had no points and 3 shots in just over 10 minutes of ice time. On Thursday against the Montreal Canadiens, however, Omark scored his first goal of the season thanks to a brutal giveaway from Habs defenseman Tomas Kaberle. 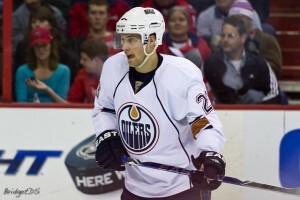 The Oilers lost the game 5-3, but Omark is hoping his spark of offence will earn him another shot. The Oilers have an abundance of skilled forwards, and Omark has the potential to be a top-six forward, but the feeling is that he might not be a fit in the organization. His call-up was due to injury, and if he stays up for another 4 games, he’ll have to pass through waivers should the Oilers send him back to the AHL. It’s likely that another team will pick him up if available. Omark’s attitude this season is much different, much more focused, and he’s just looking for a chance to prove he can contribute at the NHL level, whether it be in Edmonton, or somewhere else.